Plastic Bayonet to Screw Converter (BC to ES, for ES Bulbs). Now you can enjoy the freedom of using screw bulbs in your bayonet light fittings. 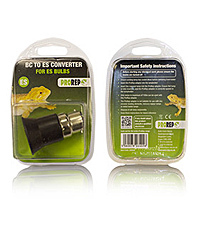 Tough plastic adapters - fully insulated and conforming to BS safety standards. Easy to use. Max 60 watt.